As of the most recent (2016) national count, there are 2,955,000 registered nurses, or RNs, working in the United States. That’s a huge number of jobs for one occupation! Not only that, RN jobs are expected to continue to grow very fast over the next ten years. RNs comprise the largest healthcare occupation for good reason; they give patients medical care, educate them about their health issues, and offer emotional support. They also help perform diagnostic tests to make effective plans for patient care. Before patients head home from a treatment or procedure, RNs explain how to manage the illness or injury. As a core member of medical teams, they consult with doctors and other health care professionals and may oversee the work of other nurses and assistants. They may specialize to provide critical care in emergency rooms, neonatal intensive care, long term care for elderly or patients who have chronic conditions, pediatrics, and more. Registered nurses work in hospitals, doctors’ offices, home health care services, and nursing homes. Some work in correctional facilities or schools, or serve in the military. Nurses may also have the opportunity to travel, as they are needed across the United States and around the world. Risks—such as back injuries from lifting patients or exposure to infectious diseases and chemicals—are part of the job. They may work nights, weekends, and holidays, and be on call in off-hours. Registered nursing is a career with enormous variety and significant differences in work settings; if you’re someone who likes to try different options, you could use your training to explore a lot of different conditions and situations. The field also offers competitive pay, with a median national annual salary of $68,450, meaning half of workers in the field earn a higher salary, and half earn less than that figure. 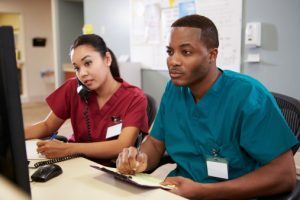 For many who choose to work in the field, nursing is a profession that satisfies the challenge of using medical knowledge and technical skills along with providing a caring, human connection to people in need. There are three paths to become an RN: a bachelor’s degree, and associate’s degree, or a diploma from an approved nursing program. RNs must also pass the National Council Licensure Examination, and meet their state’s board of nursing requirements. Some nurses earn a master’s or doctoral-level degree and work in management, research, or academic settings. Learn more on CareerOneStop’s Registered Nurse career profile. Find local training programs for nursing in your area with the Local Training Finder, or see current job postings for RNs in your area on the Job Finder.